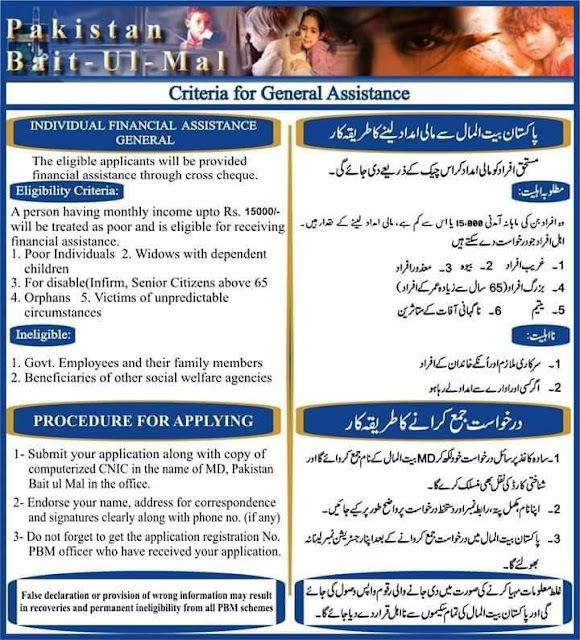 In this article, I am providing you with the most important information for those who are very poor and the Government of Pakistan have announced a great scheme for those who can not take their own treatment themselves. Students who want to complete their education but they do not get an education because they do not have money, they can also benefit from it. The purpose of writing this article is that I convey my information to the people so that they can read it and apply it to the program those who deserve this program can benefit from it. With this program, you can get up to Rs 500000. 1) All poor suffering misery and unable to overcome circumstances within available resources. 2) The victims of sudden fall in economic status due to unpredictable circumstances. 3) A person suffering from severe physical or mental disability and unable to earn a livelihood. 4) A deserving woman who is a widow or divorced or separated with liability to raise her children 5) with no source or regular source of income. 5) An invalid or infirm person secluded from family or deprived of relatives and having no source of income. (iv) Individual rehabilitation may be granted simultaneously within a period of one year to the same applicant. However, general financial assistance and rehabilitation cannot be combined. It is the method of applying the application to a simple paper. An application containing the residential address, signature or thumb impression of the applicant along with valid CNIC of the applicant. After submitting the application form, you will not lose your registration number.